Audio receiver with Mixtrax, Built in 100W*4-Ch Class-FD Amplifier, and Direct Control for ipod/iphone and certain Android phones. Audio receiver with MIXTRAX, Built-in Bluetooth, Colour Customization. 2 Din Head Unit with BT. 2 Din Entry Level Head Unit. 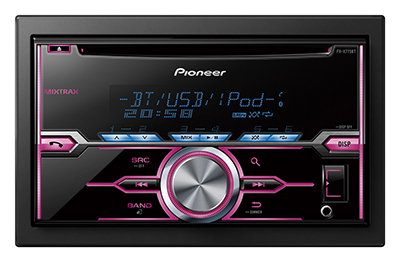 1-Din Head unit with Colour Customization & BT. Package model with 16cm & 6×9 Speakers. 1-Din Media Receiver Head Unit with BT.